My friend Evan Turk reminded me via his blog post the other day that we went to the Central Park together a few months back, when it was only slightly chilly and the leaves were still on the trees. Thanks Evan! 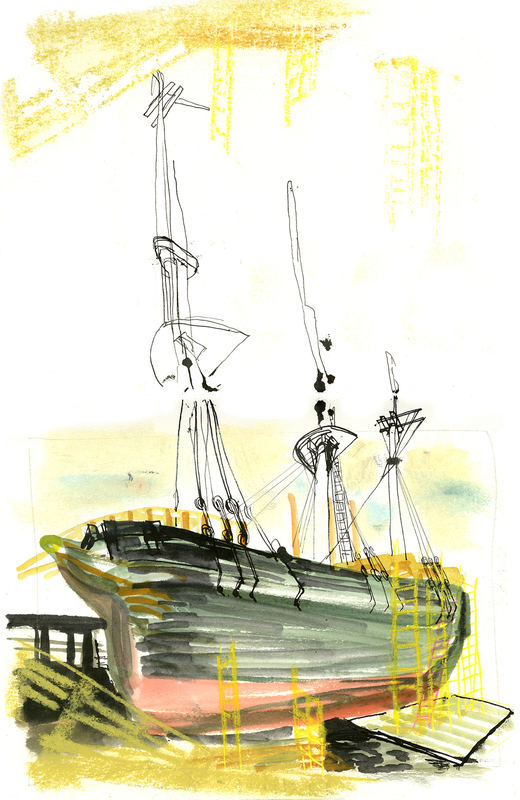 I've been going through some old drawings I made at Mystic Seaport from the past year plus, when the Charles W. Morgan finally made it into the water. If you're just tuning in, the Charles W. Morgan is the last wooden whaling ship in existence. IN EXISTENCE!! My fellow Dalverans and I had a show at Mystic Seaport a couple of years ago of our reportage of the restoration of the Morgan. In late 2013, the restoration was completed, and after years of seeing her in drydock, she was (gently!) lowered into the water. So here she is in September 2013, ready for her 38th Voyage! And here's the little thumbnail. As always, truer to my intention and the feeling I was after. If you want to see more of the Morgan, I have blog posts here and here, and a whole section of my website devoted to her here.